Kiss of the Wolf garments may be purchased from the studio, from boutiques & art galleries and from shows and special events across the country. Accessories may be purchased directly from the website as well as by the above methods. You may order a piece you’ve seen on our website or have one custom-made. We will work with you, using your measurements to create a garment in your favorite colors and design. To achieve the best possible fit, in-studio tailoring services are also available. Alteration charges may apply. Custom orders are non-returnable/exchangeable. Before placing an order, we recommend reading our Approval Service guidelines and Measuring Tips. These are valuable tools that will help make your Kiss of the Wolf purchase a happy one. For custom clothing, after reviewing our measurement tips, approval services and return policy, we invite you to set up a free phone or Skype consultation. Your size and fit can easily be determined at that time. Please contact us to place your web or custom order. All our garments are hand decorated. Variations in texture and color may occur. Display settings on devices can alter the true representation of a textile’s color. To ensure accuracy, please call for color swatches. APPROVALS are a special service we offer to assist our customers in finding their best fit and style. It is especially designed for our customers who are unable to attend our shows and for shops that may not have access to a particular customer’s size. Custom clothing can not be sent on approval. RETAIL APPROVALS require a credit card number, name, address and phone number. For best service, please provide an email address as well. ALL APPROVALS are shipped UPS. Each approval will be charged the full UPS ground service cost. We are happy to accommodate requests for faster shipping for an additional charge. WE REQUEST that all approval items be returned within two weeks unless other arrangements have been discussed prior to shipping. Otherwise, items not returned will be charged to your credit card. ALL ITEMS must be returned in the condition in which they were received. WHOLESALE APPROVALS are considered open invoices until the merchandise is returned. Kiss of the Wolf offers this service to help you find your personal look, fit and style. We will accommodate your request as quickly as our inventory will allow. It may be more accurate to have a friend or family member measure you, but it isn’t necessary. Many of these measurements may be done using a well-fitted garment you already own. When measuring yourself, remember to keep your tape measure level and not to pull it too tight. NECKLINE: Measure around the neck hole of a garment that fits comfortably. BUST: Measure around the fullest part of your bust or of a garment that fits well. WAIST: Measure around the natural waist line. HIPS/SEAT: Measure around the fullest part of your seat while standing. INSEAM: Measure the inseam of a pair of pants that fits. Lay them flat with front and back creased smooth. Measure the inseam from the crotch to bottom of the leg hem. OUTSIDE SEAM: Beginning at the waistline, measure straight down the outside of the leg to desired length. SLEEVE LENGTH: With your arm relaxed at the side of the body, measure from center back of your neck, over the point of the shoulder and down the outside of arm to the wrist. BODY LENGTH: Measure from center back neck straight down to desired length. We make every effort to ensure that each customer feels wonderful in their Kiss creation. All Kiss of the Wolf garments are guaranteed to be of the highest quality. Each piece of fabric is hand painted. Subtle color variation is normal. If you have any issues, please contact us immediately. Lori is always happy to provide consultation and our experienced, creative crew will strive to assure that you are satisfied with your Kiss of the Wolf purchase. Standard Sized Garments – Custom sized orders may not be returned or exchanged. If you request a specific size we consider that a custom order. New Condition – We cannot accept anything that has been worn, washed or damaged. Within 30 Days of Receipt – Each Kiss of the Wolf creation is considered a final sale after 30 days. There will be a 25% restocking fee for each returned item or a full credit on account for future purchases. Shipping charges are non-refundable. Please use the following address and include your name, address, phone, email, invoice # and description of return, alteration or exchange. We recommend insuring any shipment – return, exchange or alteration. It is also recommended that you call us before shipping. Kiss of the Wolf values our wholesale customers and is always pleased to assist you with information that will aid you with your customers when deciding which styles to order. Our goal is to keep you up-to-date with our Kiss of the Wolf collection. Kiss of the Wolf offers a sophisticated collection of quality wearable art. All decoration is done by hand using the finest materials. Our separates and jackets are 100% silk. Quilted pieces may use some cotton and wool or cotton batting. When placing an order, please be specific about the color and style name you are ordering. Swatches for solid, Batik, Shibori, silkscreen and other hand-painted fabrics are available in most color ranges upon request. Swatches for the various silk textures are also available upon request. Kiss of the Wolf charges for general care, alterations and repairs due to wear. These charges are determined on a case by case basis. To help your customers properly maintain their Kiss clothes and make them last for years, please see our care instructions. Custom size orders are not returnable. When placing a custom order please call us with any questions. We are happy to help you determine the correct size and style for your customer. Please refer to our Measuring Tips. We cannot be responsible for incorrect measurements. Please feel free to request a standard size to try through our Approval Service before placing a custom order. Thank you. We meticulously iron each piece before shipping but it is the nature of folding & shipping that your garments will have a few wrinkles. Hanging your garment before wearing it will help remove any creases. For stubborn creases use a warm iron on the silk setting (a medium low) and a small amount of steam. All Kiss of the Wolf garments may be dry cleaned. Always take your garments to a dry cleaner that you trust. Ask them not to press your garments because industrial ironing can stretch the crinkle silk. NEVER ALLOW THE CLEANERS TO USE SPOT REMOVER. These chemicals can strip the Kiss of the Wolf dyes. Kiss of the Wolf jackets, coats, vests, and some separates are quilted with batting. The batting and the lining will shrink if washed with soap and water. The un-quilted separates and other single layer garments may either be washed by hand or dry cleaned. Gently submerse the silk garment in tepid water with a mild soap. It is normal that some of the color will bleed. Soak the garment briefly. For the removal of oil-based stains use a de-greasing dish detergent like Dawn Dish Liquid. Put a little right on the stain and rub gently with your finger to saturate the stained area. Swish briefly in the tepid soapy water. Gently squeeze the garment to rid it of excess water. Rinse in cool water until the soap residue is gone. Gently squeeze to rid of excess water. Roll the garment gently in an old towel, then lay flat to air dry. When the garment is dry, you may use a warm iron on the silk setting with a little steam to lightly press your garment. Always press following the grain of the crinkle silk. Hand washing is for un-quilted & unlined, single layer garments only. By using these instructions many food stains and other spots can be removed with hand washing. If a piece stretches through normal wear or from a dry cleaners that has pressed your garment, then hand washing will help restore the texture of the crinkle silk. For storage of all Kiss of the Wolf silk garments we suggest that you gently roll the item, then store in a drawer or on a shelf. Even the jackets and coats benefit from rolling, especially for long term seasonal storage, so that the shoulders do not get stretched from the hanger. Store scarves gently rolled in the direction of the crinkle. Kiss garments are sold at select shops and art galleries around the country. If you’re near one of them, stop in to see and purchase Kiss of the Wolf garments. They’re all our friends, so please tell them we said Hello! Lori has been traveling to shows with Kiss of the Wolf since the beginning and has always enjoyed the opportunity to meet her customers. 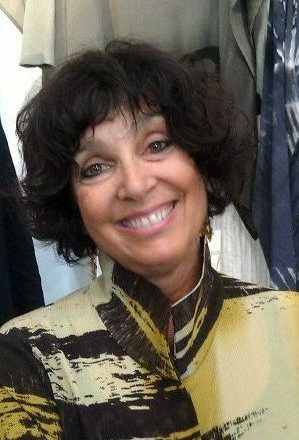 Helping each individual find the perfect garment continues to inspire her designs. We have reduced the number of shows in order to increase time in the studio, exploring new ideas and techniques. Kiss of the Wolf continues to participate in some of the finest craft shows in the country, as well as trunk shows at select few favorite shops and galleries. You may see the schedule for our upcoming events on the NEWS page.